I bought a 750watt BBS02 mid drive kit and had it shipped from China. I mounted it to an old Full suspension mountain bike that I had sunk about $1500 into but never rode anymore because it was too small for me. I also purchased a giant 48 volt 23 lb LiFeO4 battery off ebay from China for $500 that would do 40 amps continuous and 60 amps peak. 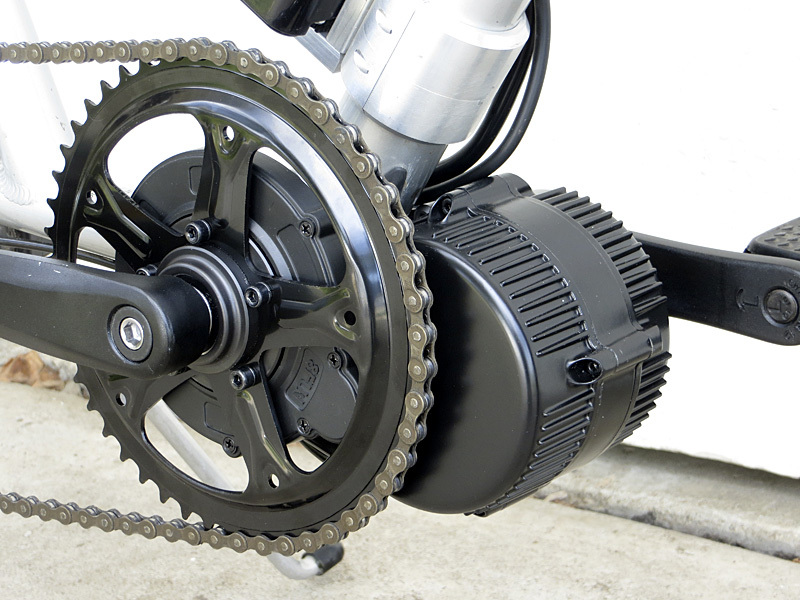 The heavy battery went in a backpack to try to keep weight off the bike and the 8.5 lb motor got mounted low near the crankset which is the best place for extra weight to be on a bike. I installed the kit in a few hours, disabled the pedal assist which totally sucked by pulling apart the controller and disconnecting a cable then I started riding it with only the thumb throttle. My first ride out I was impressed with the power, it was really hard for me to keep my front wheel on the ground. It seemed that if I was in the right gear I could climb almost anything nearly effortlessly, but if I stalled out I was stuck, it was really hard for the motor to start uphill from a standstill. It took a lot of getting used to but after a while I was riding through the woods and having a really, really great time. I wanted to ride every day, I rode until my legs were too sore to stand, I couldn’t stop thinking about it. The lightness of the motor preserved the mountain biking experience and the motor allowed me to cruise up bumpy hills at 10mph. Instead of having only about 25% of the time spent riding be fun, suddenly it was more like 95% of the riding was really enjoyable. I started spending countless hours making single track trails all over Thilde’s backyard. I felt like a kid lost in a candy store. I’ve had a lifelong love affair with bicycles that has only been soiled by my own laziness of hating to pedal up hills. Ebikes give me all the pleasures of riding without any of the slogging. After hitting the trails with world circuit Freeride racer Alex McAndrew last week I realized that I’m getting old, I’m getting slow. He responded with “an 11”. That pretty much sums up how I feel about it.